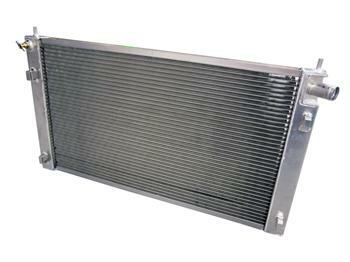 Active Autowerke Racing Radiator BMW - Dezod Motorsports Inc - Home of the automotive performance enthusiast since 2002. A must for the serious enthusiast, our E36 M3 aluminum racing radiator was designed and tested on BMWCCA race cars as well as 500+ HP Active Autowerke street cars. The design boasts not only greater capacity but also improved cooling inherent to its core configuration – a combination of winning attributes proven under arduous conditions in the racing world. These same competition advantages translate into superior performance and longevity over the stock plastic radiator in other arenas – including the everyday drive circuit. All accomplished with a simple bolt-in installation, no cutting or modifications required. Cool.